Human health is enhanced by a diet that includes adequate intake of essential vitamins and minerals. These essential vitamins and minerals function as micronutrients that sustain a wide array of biochemical and physiological processes in the body, making them necessary for normal bodily function and good health. The multivitamin and mineral supplement was intended to fill the significant nutritional void in today’s diet, promoting better health. However, because of the severity of nutritional issues with the modern diet, most multivitamins and mineral products fall severely short of this goal. Moreover, recent scientific evidence indicates that many multivitamin and mineral products on the market today may actually impede overall health by supplying an excessive amount of certain chemicals that increase oxidative stress and chronic inflammation contributing to the onset of the aforementioned chronic diseases. In addition to their inability to improve health, multivitamin and mineral products available today are typically unable to function as a performance enhancer. That is, until now. Advanced Molecular Labs has meticulously formulated a revolutionary new product, Thermo Heat Multi, that extinguishes destructive oxidative stress and chronic inflammation, promoting superior health while simultaneously enhancing exercise performance like no other multivitamin and mineral product ever has before. 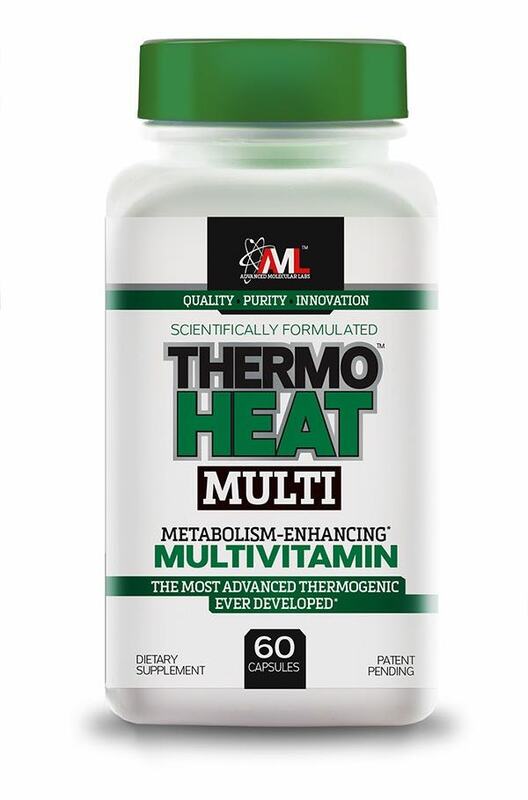 Thermo Heat Multi only contains essential minerals that improve health by alleviating oxidative stress while burning body fat, which removes chronic inflammation, leading to a more vigorous metabolism and superior overall health. One way Thermo Heat Multi accomplishes this effect is by enhancing thyroid gland function. The thyroid gland’s primary purpose is to control metabolic rate by way of several hormones, including the most important triiodothyronine or T3. Thermo Heat Multi further supports normal thyroid function by providing the mineral iodine, which is also required by the thyroid for T3 production as iodine deficiency has been shown to reduce thyroid function and decrease metabolic rate.14 What’s more, a combined deficiency in selenium and iodine appears to be even more detrimental to thyroid function, as a study by Beckett et al.15 showed that rats deficient in selenium and iodine had much lower T3 levels than in rats deficient in iodine alone, further highlighting the importance of these two minerals for optimal metabolic function and wellness. Vitamin D is unique because it promotes overall health like other vitamins while also improving muscle growth and exercise performance. Some of the health benefits associated with vitamin D include greater absorption and metabolism of calcium and phosphorous for improved bone health. In addition, low levels of vitamin D correlate with several diseases such as cancer,17 cardiovascular disease18 and obesity,19,20 indicating the requirement of vitamin D intake to prevent these disorders. Thermo Heat Multi contains 4,000 IU of vitamin D (from vitamin D3), the amount reported in the research to be beneficial for optimal health, enhanced muscle growth, fat loss, bone health and disease prevention. Body fat accumulates when energy intake exceeds energy expenditure. The ideal way to increase energy expenditure and fat loss is exercise. However, a multivitamin and mineral supplement that also increases energy expenditure should foster even greater fat loss, especially when added to a good exercise routine. Thermo Heat Multi, with its unique blend of compounds that increase energy expenditure by a process known as thermogenesis, is that supplement! Thermogenesis occurs when the production of cellular energy (in the form of ATP) is uncoupled with fat burning. As a result, instead of the energy from fat being used to synthesize ATP, it is instead converted into heat, which effectively increases energy expenditure. Brown adipose tissue (BAT) has been shown to be the most thermogenic tissue in the body because it is loaded with the protein UCP-1 that directly uncouples fat oxidation with ATP production driving thermogenesis. BAT-thermogenesis can be triggered by compounds that bind to a class of receptors, known as TRPV receptors, within the oral cavity or gastrointestinal tract. The binding of these compounds to the TRPV receptor stimulates the release of noradrenaline, which activates the thermogenic process in BAT. Thermo Heat Multi contains compounds, known as capsaicinoids, which bind the TRPV receptor and potently induce thermogenesis. In fact, studies have shown that capsaicinoids not only trigger BAT-driven thermogenesis and fat loss but also increase the levels of BAT facilitating greater levels of thermogenic energy expenditure and fat loss.22, 23 Capsaicinoids have also been shown to reduce food intake,24, 25 giving them the capability to increase energy expenditure and fat oxidation while reducing energy intake, providing a surefire way to lose body fat and keep it off. Thermo Heat Multi also contains a unique blend of spices that burn fat and suppress appetite including bioperine, cinnamaldehyde and gingerol. Bioperine and gingerol have been reported to activate the TRPV1 receptor while cinnamaldehyde activates another member within the TRPV1-family of receptors, the TRPA1 receptor. Activation of this family of receptors by these spices triggers thermogenic-energy expenditure in a similar fashion to capsaicinoids,26,27 which ultimately depletes body fat. All three compounds have also been shown to decrease appetite, giving them even greater capacity to bolster fat loss by increasing energy expenditure while also decreasing energy intake.28,29,30 An additional advantage of bioperine intake is its remarkable capacity to enhance the bioavailability, and thus activity, of many different compounds. Consequently, inclusion of bioperine in Thermo Heat Multi plausibly enhances the potency of several compounds in Thermo Heat Multi, making this already potent supplement even more powerful. Want to try the NEW Thermo Heat Multi? For a Limited Time, Enjoy 20% OFF PLUS FREE SHIPPING! Use Promo Code MULTI1. Click HERE to Purchase. A wide variety of polyphenolic compounds in Thermo Heat Multi support weight loss and better health by stimulating thermogenic and non-thermogenic fatty acid oxidation while also suppressing oxidative stress and inflammation, such as grape seed and red wine polyphenols. The remarkable polyphenol resveratrol has received widespread attention as a possible anti-aging compound. Many of these anti-aging effects conceivably come from the potent antioxidant31 and anti-inflammatory properties32 of resveratrol. Resveratrol also triggers fat loss by directly activating two key energy-sensing enzymes SIRT1 and AMPK that turn on both thermogenic33 and non-thermogenic fatty acid oxidation,34 bringing about fat loss. Thermo Heat Multi has several other polyphenols that independently contribute to its fat-reducing capacity. The polyphenolic oleuropein is one of these polyphenols that directly triggers the secretion of noradrenaline which, as previously mentioned, increases BAT-driven thermogenesis.35 Another polyphenolic with potent thermogenic properties is the compound kaempferol. In contrast to the previously mentioned compounds, kaempferol uniquely activates thermogenesis in muscle cells without triggering noradrenaline release or TRPV receptor activation. Instead, kaempferol stimulates thermogenesis by triggering thyroid hormone production,36 which activates a different thermogenic-signaling pathway specifically in muscle. Curcumin is a naturally occurring polyphenolic compound derived from the turmeric plant. It is commonly used in many parts of the world as a spice and medical agent to treat a wide variety of ailments.37 Research has identified curcumin as the active compound responsible for most of the health benefits associated with turmeric consumption,38 which include anti-inflammatory, anti-cancer and antioxidant effects.39,40 Interestingly, curcumin also activates thermogenesis by functioning as an energy-uncoupler itself, which alleviates the requirement for UCP-1. In addition to the many targets that curcumin regulates to improve overall health and fat loss, curcumin also increases production of the muscle-building hormone testosterone, resulting in a more anabolic environment that boosts the hypertrophic response in muscle tissue. The abundance of polyphenolic compounds in Thermo Heat Multi provides considerable antioxidant protection while concurrently assisting improved fat loss, which together reduces local and systemic inflammation for improved metabolic function and well-being. There are two distinct types of BAT, one being the classical BAT that derives from a muscle-like cell lineage that is typically found in rather small amounts throughout the neck and scapular regions of the body. In addition, brown fat-like cells can also emerge from the better known, and much more abundant, white adipose tissue after exposure to various stimuli such as cold temperatures in a process called “browning.” These newly formed brown fat-like cells can also thermogenically burn fat. Because of their greater abundance, they represent a better way to increase the overall amount of thermogenic-induced fat loss. Iron is an essential trace element typically found in enzymes and proteins that participate in numerous biological processes such as enzymatic reactions and the transport of oxygen throughout the body. Iron deficiency is one of the most common deficiencies in the USA, according to the CDC, creating a large demand for iron-containing supplements. However, the use of iron-containing supplements doesn’t seem to be such a good idea as the daily requirement for iron ranges from 8 milligrams for men to 18 milligrams for premenopausal women, which is normally the amount of iron found in most multivitamin and mineral products. So, you may be asking, why shouldn’t you take these iron-containing supplements, especially if they’re providing the daily requirement? Because you’re also getting generous amounts of iron from your diet, as many common foods are heavily fortified with iron such as cereals, bread and pasta. So supplementing a diet with iron-fortified foods will conceivably lead to the consumption of too much iron, which may not sound so terrifying. That is, until you realize that several recent studies have shown that too much iron in the diet can increase oxidative stress and boost inflammation,45 which, as previously mentioned, is a hallmark for many life-threatening diseases. Iron is found in the body in two forms: one form is bound to the prosthetic heme group, while the other is in a free form unbound to heme. The free form of iron can be harmful because it reacts with other compounds in the body, producing free radicals causing irreparable oxidative damage to key components of the cell, including proteins, lipids and DNA. Consequently, when inside the cell, the free form of iron is stored inside a protein called ferritin, which prevents the unwanted release of iron to avoid oxidative damage. In fact, studies have shown that increased dietary iron intake increases cellular levels of ferritin to provide greater storage capacity for the additionally ingested iron. Yet, unexpectedly, greater ferritin levels induced by iron intake actually triggers inflammation45 increasing the risk for obesity46 and diabetes.45,47 This is likely because higher ferritin levels function as a signal to the body that a lot of iron is around. The body responds to this signal by activating the immune system, which can prevent the release of iron from the primary iron-storage site, the liver. So, essentially, the body is doing its best to lower serum iron levels despite the fact that it could cause chronic inflammation and disease. In addition, this unexpected inflammation from too much iron intake may also be due to iron intake exceeding the storage capacity of ferritin, resulting in the release of free iron into the cell, causing additional oxidative damage and inflammation. Excessive consumption of the element manganese has also been identified as a health risk, as accumulation of manganese in the central nervous system promotes neurotoxicity, resulting in the neurological brain disorder manganism. In addition, elevated serum levels of manganese have been found in different neurodegenerative diseases, including Parkinson’s disease51,52,53, where manganese has been shown to promote the production of the abnormal protein aggregates called Lewy bodies that apparently contribute to Parkinson’s disease. Manganese’s deleterious influence on health is likely due, in part, from oxidative damage within the body, as manganese can generate free radicals in a similar fashion to iron and copper. Manganese also tends to accumulate in specific cells in the brain called the astrocytes, causing them to malfunction. Since the astrocyte normally provides essential nutrients to neurons, malfunction of the astrocyte prevents the required nutrition for the neuron, thus depleting neuronal function and promoting neurodegeneration.54 Because of the inherent medical risks associated with superfluous iron, copper and manganese intake, Thermo Heat Multi does not contain any form of these elements. Calcium intake has been promoted for quite some time because of its apparent ability to improve bone health. Calcium is also required for many other essential bodily functions, including nerve function, muscular contraction and the regulation of certain hormones.50,55 As a result, most multivitamins contain a considerable amount of the daily recommended allowance for calcium. However, a few recent studies indicate that calcium supplementation may not be as beneficial to bone health as once thought and may actually be detrimental to cardiovascular health. The first report states that while calcium may slow bone loss to some degree, there is no significant reduction in fracture prevention.51,56 In a second report by the National Institutes of Health, it was shown that calcium supplements, not dietary calcium, increased the risk of death from cardiovascular disease.52,57 Because of the apparent adverse effects associated with calcium supplementation along with an inability to enhance bone health, Thermo Heat Multi does not contain any form of calcium. Fulgoni VL, 3rd, Keast DR, et al. Foods, fortificants, and supplements: Where do Americans get their nutrients? J Nutr 2011;141, 1847-1854. Remington PL and Brownson RC. Fifty years of progress in chronic disease epidemiology and control. MMWR Surveill Summ 2011;60 Suppl 4, 70-77. Coppack SW. Pro-inflammatory cytokines and adipose tissue. Proc Nutr Soc 2001;60, 349-356. Hotamisligil GS. Inflammation and metabolic disorders. Nature 2006;444, 860-867. Haffner SM. The metabolic syndrome: inflammation, diabetes mellitus, and cardiovascular disease. Am J Cardiol 2006;97, 3A-11A. Lin WW and Karin M. A cytokine-mediated link between innate immunity, inflammation, and cancer. J Clin Invest 2007;117, 1175-1183. Trumbo P, Yates AA, et al. Dietary reference intakes: vitamin A, vitamin K, arsenic, boron, chromium, copper, iodine, iron, manganese, molybdenum, nickel, silicon, vanadium, and zinc. J Am Diet Assoc 2001;101, 294-301. Luo XM and Ross AC. Physiological and receptor-selective retinoids modulate interferon gamma signaling by increasing the expression, nuclear localization, and functional activity of interferon regulatory factor-1. J Biol Chem 2005;280, 36228-36236. Birlouez-Aragon I and Tessier FJ. Antioxidant vitamins and degenerative pathologies. A review of vitamin C. J Nutr Health Aging 2003;7, 103-109. Ricciarelli R, Zingg JM and Azzi A. The 80th anniversary of vitamin E: beyond its antioxidant properties. Biol Chem 2002;383, 457-465. Arthur JR, Nicol F and Beckett GJ. Selenium deficiency, thyroid hormone metabolism, and thyroid hormone deiodinases. Am J Clin Nutr 1993;57, 236S-239S. Arthur JR, Nicol F, et al. Impairment of iodothyronine 5′-deiodinase activity in brown adipose tissue and its acute stimulation by cold in selenium deficiency. Can J Physiol Pharmacol 1991;69, 782-785.
van den Brandt, PA, Goldbohm RA, et al. A prospective cohort study on toenail selenium levels and risk of gastrointestinal cancer. J Natl Cancer Inst 1993;85, 224-229. Yamada M and Mori M. Mechanisms related to the pathophysiology and management of central hypothyroidism. Nat Clin Pract Endocrinol Metab 2008;4, 683-694. Beckett GJ, Nicol F, et al. Effects of combined iodine and selenium deficiency on thyroid hormone metabolism in rats. Am J Clin Nutr 1993;57, 240S-243S. Tripkovic L, Lambert H, et al. Comparison of vitamin D2 and vitamin D3 supplementation in raising serum 25-hydroxyvitamin D status: a systematic review and meta-analysis. Am J Clin Nutr 2012;95, 1357-1364. Giovannucci E, Liu Y, et al. Prospective study of predictors of vitamin D status and cancer incidence and mortality in men. J Natl Cancer Inst 2006;98, 451-459. Lee W and Kang PM. Vitamin D deficiency and cardiovascular disease: Is there a role for vitamin D therapy in heart failure? Curr Opin Investig Drugs 2014;11, 309-314. Salehpour A, Hosseinpanah F, et al. A 12-week double-blind randomized clinical trial of vitamin D(3) supplementation on body fat mass in healthy overweight and obese women. Nutr J 2014;11, 78. Pereira-Santos M, Costa PR, et al. Obesity and vitamin D deficiency: a systematic review and meta-analysis. Obes Rev 2015. Marcotorchino J, Tourniaire F, et al. Vitamin D protects against diet-induced obesity by enhancing fatty acid oxidation. J Nutr Biochem 2014;25, 1077-1083. Whiting S, Derbyshire E and Tiwari BK. Capsaicinoids and capsinoids. A potential role for weight management? A systematic review of the evidence. Appetite 2012;59, 341-348. Ludy MJ, Moore GE and Mattes RD. The effects of capsaicin and capsiate on energy balance: critical review and meta-analyses of studies in humans. Chem Senses 2012;37, 103-121. Jwa H, Choi Y, et al. Piperine, an LXRalpha antagonist, protects against hepatic steatosis and improves insulin signaling in mice fed a high-fat diet. Biochem Pharmacol 2012;84, 1501-1510. Mansour MS, Ni YM, et al. Ginger consumption enhances the thermic effect of food and promotes feelings of satiety without affecting metabolic and hormonal parameters in overweight men: a pilot study. Metabolism 2012;61, 1347-1352. Kim MJ, Son HJ, et al. The TRPA1 agonist, methyl syringate suppresses food intake and gastric emptying. PLoS One 2012; 8, e71603. Hung LM, Chen JK, et al. Cardioprotective effect of resveratrol, a natural antioxidant derived from grapes. Cardiovasc Res 2000;47, 549-555. Rahal K, Schmiedlin-Ren P, et al. Resveratrol has antiinflammatory and antifibrotic effects in the peptidoglycan-polysaccharide rat model of Crohn’s disease. Inflamm Bowel Dis 2012;18, 613-623. Alberdi G, Rodriguez VM, et al. Thermogenesis is involved in the body-fat lowering effects of resveratrol in rats. Food Chem 2013;141, 1530-1535. Baur JA, Pearson KJ, et al. Resveratrol improves health and survival of mice on a high-calorie diet. Nature 2006;444, 337-342. Oi-Kano Y, Kawada T, et al. Oleuropein, a phenolic compound in extra virgin olive oil, increases uncoupling protein 1 content in brown adipose tissue and enhances noradrenaline and adrenaline secretions in rats. J Nutr Sci Vitaminol (Tokyo) 2008;54, 363-370. Sharma RA, Gescher AJ and Steward WP. Curcumin: the story so far. Eur J Cancer 2005;41, 1955-1968. Aggarwal BB, Sundaram C, et al. Curcumin: the Indian solid gold. Adv Exp Med Biol 2007;595, 1-75. Abe Y, Hashimoto S and Horie T. Curcumin inhibition of inflammatory cytokine production by human peripheral blood monocytes and alveolar macrophages. Pharmacol Res 1999;39, 41-47. Kawanishi S, Oikawa S and Murata M. Evaluation for safety of antioxidant chemopreventive agents. Antioxid Redox Signal 2005;7, 1728-1739. Jager S, Trojan H, et al. Pentacyclic triterpene distribution in various plants – rich sources for a new group of multi-potent plant extracts. Molecules 2009;14, 2016-2031. Kunkel SD, Elmore CJ, et al. Ursolic acid increases skeletal muscle and brown fat and decreases diet-induced obesity, glucose intolerance and fatty liver disease. PLoS One 2012;7,e39332. Zhang Z, Zhang H, et al. Berberine activates thermogenesis in white and brown adipose tissue. Nat Commun 2014;5, 5493. Lee YS, Kim WS, et al. Berberine, a natural plant product, activates AMP-activated protein kinase with beneficial metabolic effects in diabetic and insulin-resistant states. Diabetes 2006;55, 2256-2264. Andrews M, Soto N and Arredondo-Olguin M. Association between ferritin and hepcidin levels and inflammatory status in patients with type 2 diabetes mellitus and obesity. Nutrition 2015;31, 51-57. Iwasaki T, Nakajima A, et al. Serum ferritin is associated with visceral fat area and subcutaneous fat area. Diabetes Care 2005;28, 2486-2491. Jiang R, Manson JE, et al. Body iron stores in relation to risk of type 2 diabetes in apparently healthy women. Jama 2004;291, 711-717. Brewer GJ. Alzheimer’s disease causation by copper toxicity and treatment with zinc. Front Aging Neurosci 2014;6, 92. MacDonald G, Nalvarte I, et al. Memo is a copper-dependent redox protein with an essential role in migration and metastasis. Sci Signal 2014;7, ra56. Jimenez-Jimenez FJ, Molina JA, et al. Cerebrospinal fluid levels of transition metals in patients with Parkinson’s disease. J Neural Transm 1998;105, 497-505. Takagi Y, Okada A, et al. Evaluation of indexes of in vivo manganese status and the optimal intravenous dose for adult patients undergoing home parenteral nutrition. Am J Clin Nutr 2002;75, 112-118. Hozumi I, Hasegawa T, et al. Patterns of levels of biological metals in CSF differ among neurodegenerative diseases. J Neurol Sci 2011;303, 95-99. Sidoryk-Wegrzynowicz M and Aschner M. Manganese toxicity in the central nervous system: the glutamine/glutamate-gamma-aminobutyric acid cycle. J Intern Med 2013;273, 466-477. Brady DC, Crowe MS, et al. Copper is required for oncogenic BRAF signalling and tumorigenesis. Nature 2014;509, 492-496. Larsson SC. Are calcium supplements harmful to cardiovascular disease? JAMA Intern Med 2013;173, 647-648. Reid IR. Should we prescribe calcium supplements for osteoporosis prevention? J Bone Metab 2014;21, 21-28. 57. Bolland MJ, Avenell A, et al. Effect of calcium supplements on risk of myocardial infarction and cardiovascular events: meta-analysis. Bmj 2010;341, c3691.